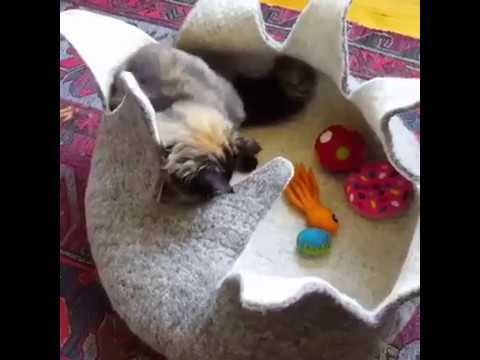 Our 14″ basket is great for cats and small dogs, up to 14 lbs. The roomy 20″ basket is perfect for larger pets, up to 25 lbs, or a couple of average size cats/toy dogs or a whole litter of kittens or puppies. Cats will have as much fun playing with their toys in it as sleeping. Our photographers gorgeous 16 lb cat is pictured in the 20″ basket. In the videos, our 6 lb. 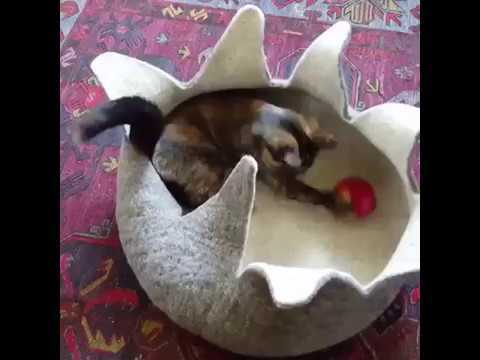 kittens Shimi and Momo play with their toys in the 20″ basket. The Himalayan wool we use for our toys and beds is not chemically cleansed, so it has a lot of lanolin in it. Lanolin is the natural oil unique to sheep’s wool and it reminds cats of the scent of their mother. Lanolin oil conditions their paws and helps to keep their fur healthy and shiny. Care: The lanolin in the wool is anti-microbial and odor resistant which keeps our wool beds and toys naturally clean. They can be vacuumed or spot cleaned with a sponge. If a bed becomes very soiled, turn it inside out, and wash it in the delicate cycle of a washing machine. You will find care instructions on your purchase.